The EarthWay sand painting is to remind us that all traditional cultures in the Northern Hemisphere perceive Bearboth embodied Bear and Bear Spirit- as the supreme physician who, as guardian of other animals, knows which beings to call upon to assist in healing. Bear Healing Societies among these cultures are often composed of women only, with varying degrees of knowledge, expertise, and ages within the Society. They, too, have times of gathering, teaching, and sharing. Since the task of learning how to do healing is so important to the health of the community, I imagine there is incredible patience, compassion, excitement, and generosity in their gathering times. Those who walk this path know it takes time, suffering, discipline, and a loving heart to learn the ways of Spirit healing. An older woman once commented: "women usually come into their power in the forties. Then if they are going to do this work, they have to get rid of themselves, peel off their old habits the way you peel an orange. They have to quit looking back; you must go forward and be strong. The stream of life gets rough sometimes. You have to learn how to handle the canoe; keep out of the rocky places, the shallow water. You have to fix up those torn spots. You will hit bottom if you aren't impeccable with your power because the Spirit wants love between souls, not emotional torment." We continue this ancient tradition of coming together as women: learning, sharing, healing. I am also aware that we are of 'various ages' both chronological and in our apprenticeship with Spirits. This is important to value and respect. To do this work, we each need to continue learning, go beyond what's known to us now. We also need to be aware of our limitations. At the same time, we are here to offer the ways and teachings with which Spirits have gifted us yet knowing that it's not a 'show and tell' but a 'do and share' exchange in learning. We are all students; we are all teachers. We need to be aware when we have a question (rather than an answer); when we have the answer (so there is no question). I bring up this issue of our range in experience because shamanic healing ability is learned (usually) over a period of time. Some of us have had years with this work, at least as taught by the Foundation or perhaps from other sources. Others of us have less experience. We can learn from each other. The diversity is a blessing. Following are notes I thought might be of benefit in our work together. Some of these notes provide information or context for our work. Hopefully reading the notes will mean less need, on my part, to talk about some issues and, each of us can use them as 'springboards' for finding and following our own path of healing with Spirits. I am also going to list issues I think are important in shamanic healing. Some of them we may cover; others we may not have the time for but you can journey and explore them in the future. In referring to someone receiving healing, I use the word 'client.' I don't like this term. I don't like the term 'patient' either and "healee" sounds too strange. Eventually a different word will come. We all know the importance of having clear intention in doing specific shamanic activities. What's different in this gathering is that our Intention needs to be held for the entire time together. This is what it means to come together for ceremonial healing work. The more we are together with attentive hearts, the more we'll learn about healing and the more we'll be able to work on behalf of others. This is not a 'limiting' way of talking about our time together. I can't imagine more joy than when a community, a village comes together for healing purposes. Shamans know the Spirits rejoice and all beings are responding 'yes, yes, yes' when humans gather to learn how to help in mending the hoops of their lives and establishing good relationship with other beings. On the other hand, it does require an awareness of heart, of conversation, of how we are together. We plant seeds with every thought, we grow the words and the actions that result. We want to plant seeds that grow healing words and actions. As with other living beings, they have spirit, voice, certain qualities, and their own stories. With any of your objects, it's important to connect with their Spirit, find their voice, hear their stories, and know how they are to be used under what circumstances. A certain crystal may be beautiful, possess what you've discovered to be fantastic qualities but that doesn't mean this crystal wants to work with you or is appropriate for working with a particular person at this time. Drum: does your drum want to work with you today? In healing work, often we just pick up the drum and start beating it. Listen to your drum, perhaps it doesn't want to be played now. If not, then it shouldn't be. Let the drum teach you when it should be played in ceremony. Rattles: different rattles have different voices which, in turn, bring different resonances to you and to others around you or to someone on whose behalf you are doing healing work. The same rattle has different voices when held or shaken in various ways: upside down, sideways, circular, slow pace, fast pace. Experiment with your rattle. Listening to what it evokes in you and other beings surrounding you is useful. Once you have your intention clear in your healing work, discover how the rattle wants to be used. We will journey on how to cleanse and charge our tools. It's important to learn how to 'arouse' or awaken the power within your tools just as we arouse and awaken ourselves. It's important to know how to cleanse our tools just as we cleanse ourselves. All our tools are derived from the natural world. To learn more about a particular tool it can be of real benefit to take it into the land, amidst other creatures of the land community, and see how it lives in relationship to them; see how they respond to your objects. The communication which can occur between your tools and other beings in the natural world can sometimes amplify the power of your tools as well as 're-store' them within the natural community. Some peoples say the chant and dance are moving, singing prayers and healing work is done through this type of prayer. The sounds we express, through our bodies and with instruments, have the potential to bring incredible changes to our quality of life, to the community's quality of life, and to someone who is being healed. Basically life is resonance. So if someone is dis-eased, then we could say they are 'out of tune'. Our songs, and sounds create certain vibrations. Through partnering with Spirits and using a certain vibration, healing may occur. Dancing is always used (even if this is merely swaying) as preparation for healing work. Many healers are dancing during the healing itself. 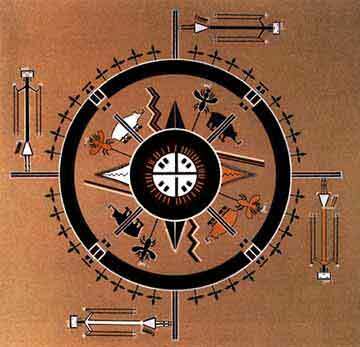 Across cultures, this is spoken of as 'raising the heat' within one's self, raising the powers in the healing Circle. Ceremonies often include periods when the shaman's seeming work in 'healing the client' is stopped and the healer (and others in the Circle) then go through a period of dancing. This can be done when the healer wants to call on more Spirit power; when the healer is finished with one phase of their work or, in some cases, when dancing is used to 'drive away' the cause of the illness. Shamanic healing is focused on bringing the client to increased spiritual health. The shaman often will use various ways of awakening the distressed person's sensory powers which we can think of as our 'receiving powers.' Thus, in the ceremony many forms or activities are done to awaken the senses, to amplify the power of the senses. For example, color, fragrance, movement, sounds, textures, touch, taste, shapes (visions) are some of the aspects used both for healing and luring the presence of Spirits. The Navajo phrase "the Beauty Way' indicates that beauty, manifested in different ways, can help to restore the spirit of someone who is ill. We'll discover what, amongst these ways of 'awakening the senses', emerges as important teachings for us this week. I invite you sometime to journey, experiment with, and discover more about the aesthetic sensibilities that are considered to be primary 'movers' and 'awakeners' by most shamanic cultures. Every human society has health practitioners. Depending on the culture they belong to, they are called physicians, healers, acupuncturists, shamans, witch doctors, medicine men/women, sorcerers, or something else. All such healers have theories and models of how the body works, what kinds of things go wrong with it and why, providing them with a basis for diagnosis and treatment according to the healing traditions in which they work. In shamanic cultures the basic model is that suffering and illness have a spiritual component. Unless the spiritual malaise is treated, the individual will continue to be sick or suffer misfortune. In these cultures there are various types of other healers: for example, some may heal with plants, set bones, do massaging of the body, etc. Just as modern medicine has a range of specialists, so do shamanic communities. The shaman's focus, however, is on doing whatever is required to restore the person's spirit to connection with the Wholeness of the Universe. They are assisting the person in linking up with their own sources of spiritual power. From this reconnection, other distresses may be resolved by the body's own self-repairing system, a healing system that is something we share with all of nature. We share it with the rivers, plants, animals: with everything that has this capacity to heal itself when disturbed. It is a tendency to seek equilibrium. An important issue to explore and understand is that shamanic healing is focused on the spirit of a person or other being. When someone states that they are in distress from physical illness, the shaman seeks the spiritual manifestations of this illness and this is the focus of the healing. However, the shaman may work in collaboration with another healer or doctor who is treating the physical problem while the shaman focuses on the spirit's distress. This issue of the difference between shamanic healing and other healing can be somewhat illuminated by considering the term "alternative treatment or alternative medicine." The word alternative usually means "instead of" and has come, within our culture, to often describe competing methods of healing. It is not an either/or when we are working to relieve suffering. Sometimes it is a collaboration; sometimes one method works better for certain problems than does another. Sometimes a person has a physical ailment but their Spirit is healthy; sometimes they are suffering spiritually without any physical manifestations. In terms of what's most desirable, those who work with people who are suffering would collaborate and use their different methods to assist in restoring the person's spirit, mind, and body. Remember: the shaman is concerned with the soul's journey through all the realms in which the soul moves. Before birth, during life in this world, leaving this world, and returning to the Source from which we came. We are challenged in this work, I think, because the medical model is so ingrained in our consciousness. The issue surfaces when we consider the relationship between specific physical ailments and the soul. Our culture (and ourselves as members of this culture) is wedded to the medical material model of illness and healing and curing. The medical model seeks to cure the ailment and the symptoms. And modern medicine is an incredible gift when used for that which it does best. In doing shamanic healing, it's important to remember we are not focusing on the 'material' aspect of the illness but on the spiritual. Someone may go to a doctor because they have an infection, fever, and the doctor gives them medicine to get rid of the infection. In the same instance, the person may seek to see someone for shamanic healing because there can be a 'spiritual infection' also. But it is not a one-to-one correlation. The shamanic path seeks to restore the soul's vitality. In doing this type of healing, the physical complaints are often signs (presented to the shaman) of the distress of the soul. We don't know how our healing work will affect the physical ailments. The issue has to do with the client's response to the illness and if the response is one of suffering, then the shaman seeks to relieve this suffering by healing the soul for it is the spirit which is becoming diminished in the reaction to the suffering. Finally, since we are vessels with the Spirits moving through us to work on behalf of another person, we often don't actually know what is happening except that healing is occurring. If we have a goal in mind of healing or curing some particular ailment, we may get in the way of the Spirits. This is why it's so important to remember it is the Spirits who are doing the work. In working with illness, the shaman consecrates the place in which the sessions will occur and summons helpers, guardian spirits, and establishes direct contact with these invisible powers. The shaman makes sure the helping Spirits have arrived before continuing. When Shakespeare's Welsh seer, Owen Glendower, boasts "I can call spirits from the vastly deep," Hotspur deflates him with the commonsense answer: "Why, so can I, or so can anyone. But will they come when you do call them?" It is not every call that gets answered but the answerable call. Once the "answerable call" is made and Spirits arrive there are steps involved in the healing. These steps are not necessarily always sequential and sometimes they are repeated during the same ceremony or in following days. diagnosis (finding the source of the illness; where it is in the body; ,etc. ); there are different ways of learning to see, know or uncover the manifestations of spiritual distress within the body. This is often referred to as "scanning the body" to see the signs of illness. employing the healing methods according to the shaman's particular culture which also involves working with the Spirits and sacred objects.. These helping Spirits and objects are unique to each shaman although the same healing methods exist across cultures. The healing sessions may include only one shaman or several shamans working together. The entire village is involved in supporting the ceremony. Since we don't live our ordinary lives in such villages, it's good to have friends or family members suppor during these sessions. This is the gift of our time together for we are a Village. (this is a simplified list but much is included other these. For example, a foreign intrusion could come as taking in negativity because my spiritual 'immune' system is low; soul loss could include 'giving my soul' to someone I love who was dying and is now gone). The deeper one goes into this work, the more the issue of trust, surrender, receiving, and giving arise as primary issues in the processes of shamanic healing. Healing may be like planting the seeds; the harvest is not immediate. In doing healing work, it's important not to become attached to some particular outcome; it's also important for us to share with the 'client' that the harvest comes in its own time. Healing has occurred, but just when this is manifested is another matter. For some the effect is immediate; for others it may be weeks, months, or years. At the same time, when someone is suffering, it is useful to do more than one healing ceremony, sometimes within the following days; sometimes in the distant future. If the person is still 'troubled' then it's useful to journey and see what else you might do on their behalf or if there is someone else to whom you might refer them. Finally, when we are partnered with Spirits, learning and doing healing, one reason for detachment from outcome is because there is no such thing as 'failure.' We can't fail (nor does the client); we can only learn. This work is experimental, experiential, and we are searching for the links, the bridges, the ways to move or bring the healing powers of the Spirits into our everyday life, on behalf of other beings, and the Earth herself. Why I called our Gathering "The Healing Way"
I have described above the classical diagnoses and treatment models that have come to be the way we talk about shamanic healing. However, I'm not yet satisfied with some of this conceptual framework. When Spirits are invoked, when we have prepared ourselves as vessels to do healing work, one never knows (unless you decided beforehand - which isn't shamanic healing) just what will happen. One doesn't know until the actual experience what we will be asked to do or what the Spirits will 'show up and do.' We do know we have invoked healing Spirits. We know the community opens its heart to the client and to the Spirits and supports the ceremonial sessions. When we are thus in ceremony, the Spirits may move or propel us, merge with us, and perform activities through us. This is the nature of shamanic trance, shamanic ecstasy. This is what it means to surrender to the Spirits on behalf of the client. It almost doesn't matter where one begins as long as one is led by Spirits, as long as the connection is clean, motives pure. Once we begin and make the connection, the bridging of Powers from other realms, then the healing power goes where it needs to go to help the client. We are a complex Web of Being. Healing involves connecting old wounds with new circuitry, exciting the health that struggles to surface, luring the knots that bind into loosening. As you work, Spirits (and you) will know when the person is coming together to breathe fully again; when the blood is moving, clean like good water. You'll hear the humming of the person's Spirit re-membering home is here, not elsewhere. You'll know that Spirits are somehow helping to heal this person's Spirit. We have to develop conceptual frameworks in order to share and teach each other, to pass along. But the conceptual framework needs to breathe also and it's important not to let the love that's required in this work get buried in constructs and notions of illness and treatment that may be part of the source of the problem. At best, the concepts should truly illuminate what it is we are doing and how to share this work in an authentic way. That's my personal challenge; I think it's our common challenge as practitioners of shamanic healing. And I think for all of us in healing professions, the challenge is how to integrate shamanic work into our current 'medical' models and the ways we practice medicine/therapy. We will thank and bless the Spirits and Beings of the Land on which we are gathered. If possible (time-wise) we might do an earth healing ritual. If this does not happen (and gratitude is what the Land simply request of us), I want to remind us that healing rituals dedicated to Earth both for healing and for renewing are important in shamanism. Walking this path means I have both been chosen and I choose to care for the health of my people in all their totality which includes the entire ecology within which my people live, breathe and have their being. You can journey on what rituals to do. You can, for example, journey on what to do to call the essence of water (rain), decrease the energy of fire (forest fire) or in places where there's been strong, specific abuse, doing soul retrievals for that place. For example, sometimes grave sites have been trammeled, disturbed. Many shamans understand that there are Guardians of these sites and after such abuse, they know they need to go and work with Spirits to bring back and help heal both the Guardian and that particular site (and, of course, sometimes with the spirits of the dead who have not yet completely crossed over but are lingering around the grave site). This is the kind of journey that would be marvelous to do at the Summer Solstice when Earth is so fully abundant, so fully giving...to see is there some place, some way, some ritual I (or a Circle) could do to restore and renew some Earth-place.